"Chapters are well organized, making the book easy to follow….good resource for graduate students, faculty, and university libraries." "The articles included are clearly written at a level that should be accessible to any educational professional familiar with learning theory and technology. The chapters of the book are essentially research papers and, as such, meet a high standard of timeliness." "The greatest strength of this book is in its ability to demonstrate the ways in which technological learning tools foster deep understandings of difficult scientific and mathematical knowledge and ideas. Innovations clearly encapsulates the role of visualization, simulation, modeling, and computer-based manipulation in the development of increasingly complex scientific concepts and abstractions." "Represents the state of the art in designing learning environments….An important collection." Contents: M.J. Jacobson, A.J. Angulo, R.B. 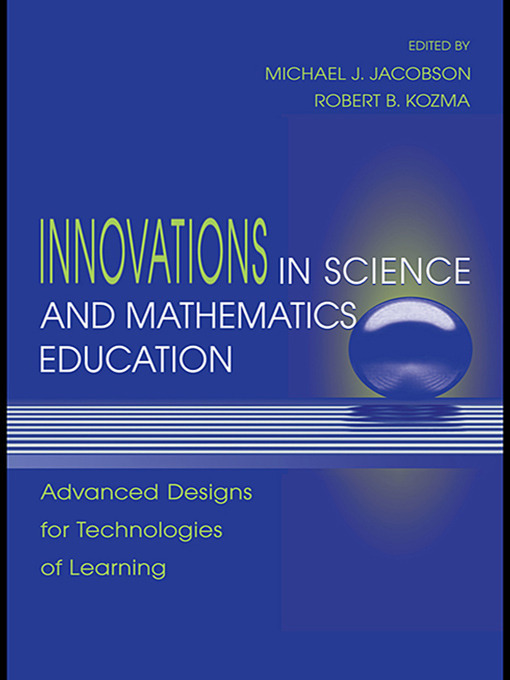 Kozma, Introduction: New Perspectives on Designing the Technologies of Learning. R.B. Kozma, The Use of Multiple Representations and the Social Construction of Understanding in Chemistry. J. Roschelle, J.J. Kaput, W. Stroup, SIMCALC: Accelerating Students' Engagement With the Mathematics of Change. S.J. Metcalf, J. Krajcik, E. Soloway, Model-It: A Design Retrospective. M.J. Jacobson, A. Archodidou, The Knowledge Mediator Framework: Toward the Design of Hypermedia Tools for Learning. P. Horwitz, M.A. Christie, Computer-Based Manipulatives for Teaching Scientific Reasoning: An Example. J.D. Slotta, M.C. Linn, The Knowledge Integration Environment: Helping Students Use the Internet Effectively. M. Guzdial, J. Turns, Computer-Supported Collaborative Learning in Engineering: The Challenge of Scaling-Up Assessment. P.M. Sadler, R. Gould, K. Brecher, B. Hoffman, Asstronomical Experiences Using Internet-Accessible Remote Instumentation. B. Means, E. Coleman, Technology Supports for Student Participation in Science Investigations. B.Y. White, J.R. Frederiksen, Technological Tools and Instructional Approaches for Making Scientific Inquiry Accessible to All. C. Dede, M. Salzman, R.B. Loftin, K. Ash, The Design of Immersive Virtual Learning Environments: Fostering Deep Understandings of Complex Scientific Knowledge.